Editorials from Theslowlane: You sat in a logging truck on Earth Day? You sat in a logging truck on Earth Day? A friend of mine didn't think that was "the politically correct" thing to do on Earth Day. He was kind of horrified, but I forgot it was Earth Day. Senator Gaylord Nelson, credited for founding the day, passed away July 3 so lots of stories are being told. My story is about sitting in a logging truck on that day in 1991, and I don't even drive. It was a bike ride to the Skagit Valley Tulips fields. A one day fitness class from the YMCA. After peddling around in the tulips, I suggested dropping by the headquarters of Paccar International. Paccar was having an open house. Other class members liked the idea. Often wondering what Paccar did, the open house would be an opportunity to find out. It tests trucks, big ones. We dropped in for the tour, free cookies also. It was another happening at the Skagit Valley Tulip Festival. Paccar puts big trucks through the tests. Shakes them on hydraulic shakers, runs them around a track, puts all kinds of sensors in them. Tour ended in the garage. A room full of trucks. Logging trucks, tractor trailers. Lots of trucks on display. People were invited to climb into the cabs, look around, even honk the horn. Kids loved it. I climbed into a logging truck even though I've never even driven a car. It felt powerful and yes the horn worked. Then it was back to our bicycles for the trip to Bellingham where I got a phone call from a friend. "What did you do today?" he ask. He was horrified and reminded me that this was Earth Day. To me, it wasn't that inconsistent to be sitting in a logging truck. Earth Day was a great idea, but it's also symbolic. The one day each year that people think about environmentalism. Railing against logging trucks is another symbolic thing. The true problem is consumptive lifestyles and overpopulation the rest of the year. People who live in wooden houses, use paper products, depend on our economy might be able to appease their guilt by lashing out at the logging industry. It can be railed against, pushed out of sight, pushed overseas, but still exists as long as its products are in demand. 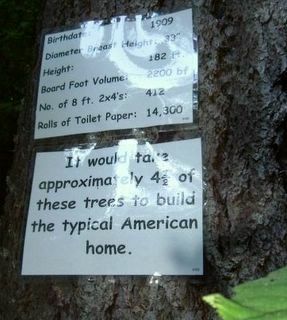 There is also the concept of "responsible logging." Yes, that industry is part of our lives, but (like so many things) dialog can be used to make it more responsible. That same dialog applies to our personal lives which create the need for the industries. Even though I had forgotten that it was Earth Day, I did spend the day bicycling. The bike trip was a great way to celebrate that day. Some of the staff out at Paccar was impressed. They said, "you biked all the way here?" "Didn't know it could be so fun." Liberate those loggers from their workaholic loads. Let's all work "part time." That's responsible stewardship of the environment. Just log part time for sustainable yield. Picture: Display in Starker Demonstration Forest near Corvallis, Oregon. Seen on my 2004 bike tour.